Now that we are fully into summer in San Diego County, our yards should basically be at the point where we are realizing the enjoyment that we spent months working for every weekend. Summer in San Diego is a beautiful time to be outdoors, and homeowners who have put their time in outside can boast of flowering plants, colors everywhere and of course a plush and green lawn. It obviously takes work to achieve this goal, and that work involves dealing with natural enemies as they arise and make things difficult. One of the most difficult enemies to attempt to deal with for any homeowner is Bermuda grass. This tough and rugged plant is extremely prevalent in San Diego County, as it loves the sun, it loves heat and it does well in relatively dry weather. It’s also extremely invasive and aggressive and it will all but choke off your preferred species of lawn if you’re not careful. When Bermuda grass does invade a yard, you need to be just as aggressive in dealing with it. Below are five ideas for fighting this difficult and ongoing battle. 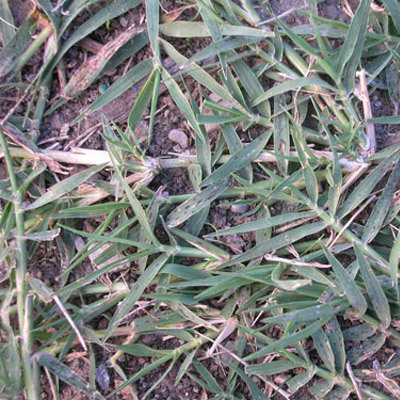 The most common way for homeowners to deal with Bermuda grass is with herbicide. These chemicals can be effective in killing off this grass, but many people want to avoid the spraying of chemicals for different reasons. Another method that can be used is known as stripping. Stripping involves removing the grass from a lawn and then placing a thick material such as cardboard on top of the remaining soil for a period of several months. For areas that may not be covered by lawn, weed cloth can be effective in preventing the spread of Bermuda grass. However, many people recommend doubling up on the weed cloth for an extra layer of protection. We all remember those times as kids when we burned things with a magnifying glass in the sun. We can use that same concept to kill off Bermuda grass. Homeowners can spread clear plastic over Bermuda grass in warmer areas and allow the sun to kill it. Finally, homeowners can handle Bermuda grass the old-fashioned way – grab a shovel and dig out the Bermuda grass. After the digging is done, it’s a good idea to pull the roots out of the clumps of dirt in order to save the soil. Overall, fighting Bermuda grass is extremely difficult. Anyone who has dealt with it will tell you that it just keeps on coming. The best way to handle it is to stay ahead of it, but the bottom line is that few people have enough time to spend in their yards on a daily basis preventing its spread. That’s why people in this position should make use of San Diego landscapers who know what it takes to keep lawns looking fresh. If this includes you, contact Juniper Landscape Company today to learn more about how we can help you.